Cloud is a hot commodity in the IT community just now and we are all thinking that we should be migrating all or some of our IT infrastructure. The environment is rapidly changing and hybrid cloud is all the rage. But it can be hard to put a long-term hybrid cloud strategy in place. The hybrid cloud model allows you to deploy a combination of private and public cloud services. You can move workload between clouds using them at their optimum comfort level. Cloud bursting allows you to use public clouds if and when capacity demands spike. 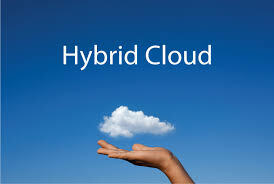 Hybrid clouds are dynamic IT entities that can be challenging to deploy and manage. Having a robust road-map will help you mitigate oversights or unexpected industry changes that could cripple your hybrid cloud. It’s important to consider all the trade-offs and not loose site of some of the more invisible benefits. What MUST be part of the map? The provider going out of business – how are you going to get your data back and where are you going to store it in the short term? The provider failing to uphold its SLA – how are you going to move your business elsewhere? You should have an up-to-date list of alternative suppliers and have had initial conversations to start building a relationship? We all know that there is a raft of official compliance to be managed and cloud is no exception. Perfectly acceptable cloud deployment today may not be compliant when regulations are introduced or updated. Make sure that you have a tried and tested process for introducing change and managing a compliance audit. Moving from one cloud platform to another can be complicated and expensive. Containers make it easier to move workloads between various cloud types. Containers encapsulate application workloads thus providing portability. Moreover, you can use clustering services such as Google Kubernetes and Docker Swarm. Container clusters are easy to manage and work well with hybrid cloud computing where you might be using different types of cloud for different purposes. If you have multiple cloud platforms for various applications and services you may well be dealing with native interfaces and that can be complex and disorderly. With a Cloud Management Platform (CMP) resources can be managed from a single domain with good automation and controls. Users will get one, simple access route into public and private clouds even when there are different interfaces . Institutions can benefit from other automation services to manage usage through policy-based approaches that work with many back-end cloud-based technologies in a single unified system. You may have already bought rafts of hardware for part of your cloud strategy. If the strategy changes and you are under pressure to move entirely to public cloud remember to point out that you can’t recover those hardware costs. In many cases maintaining a private cloud as part of a hybrid cloud strategy will be more cost-effective. The hardware investment has already been made and a hybrid approach can help recover that value. Cloud strategy is always built on moving sands and you will need to be agile to stay upright; having a proper understanding of the environment and some reliable, basic building blocks will help.